Attractive white finish makes a first-class impression when sending valuable artwork, posters, etc. Being visually appealing to your customers and businesses is imperative in today’s world. 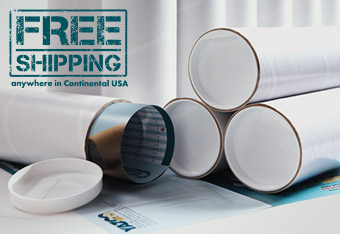 Our heavy-duty white mailing tubes are manufactured with an eye-catching high-quality white gloss finish which radiates a clean, modern, and pleasing look. All of Yazoo’s white tubes are heavy-duty and tested for superior strength. Whether you’re sending vintage posters, valuable artwork, or important documents, our heavy-duty white tubes are a cost effective product that guarantees your valuables are kept safe. Yazoo’s white mailing tubes also come with plastic end plugs and are in-stock for FREE same-day shipment on orders placed by 4pm EST. Extra space has been allowed for the plastic end plugs. Minimum order 1 carton. Full cartons only. For special diameters, colors, thickness, or lengths contact our sales department.